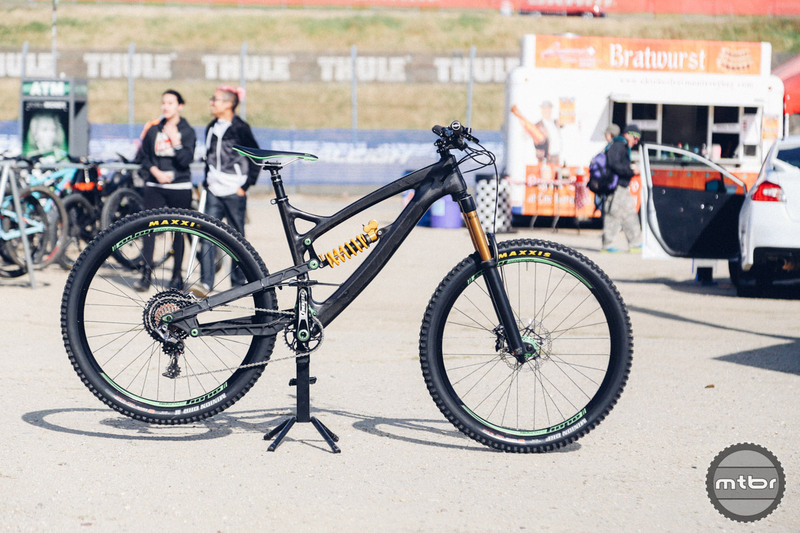 This custom one-off carbon mountain bike is named after the RB211 engines built by Rolls-Royce to power airplanes (click to enlarge). 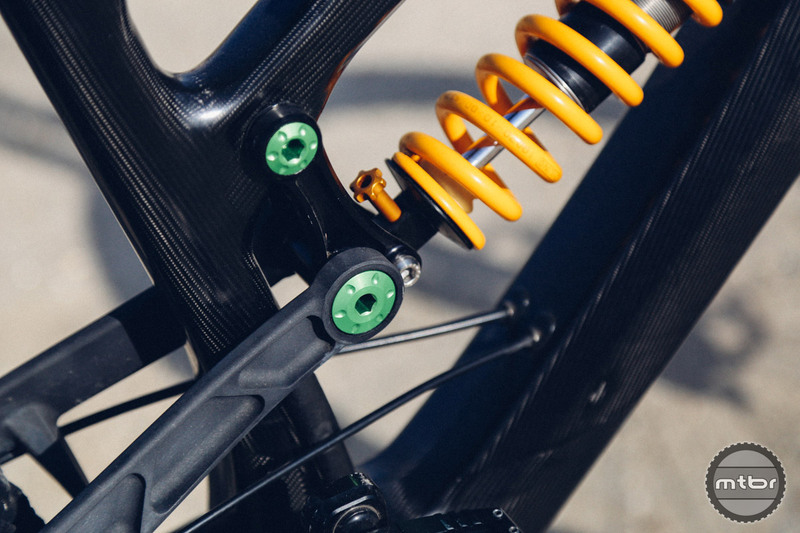 If you had free reign to design a bike without constraints, what would it look like? That’s the sort of thinking behind Hope’s latest project, a completely custom enduro bike built to showcase the UK brand’s manufacturing capabilities. Hope recently released a line of carbon handlebars and seatposts that are produced in their UK factory (click to enlarge). The 160mm travel frame utilizes a conventional four-bar linkage, but the rest of the bike is anything but ordinary. Created as a pure design experiment, with no immediate (or future) plans for production, the entire project revolves around the concept of optimized integration – which is only possible when you can produce every component in-house. There are very few components on this build that aren’t produced by Hope (click to enlarge). 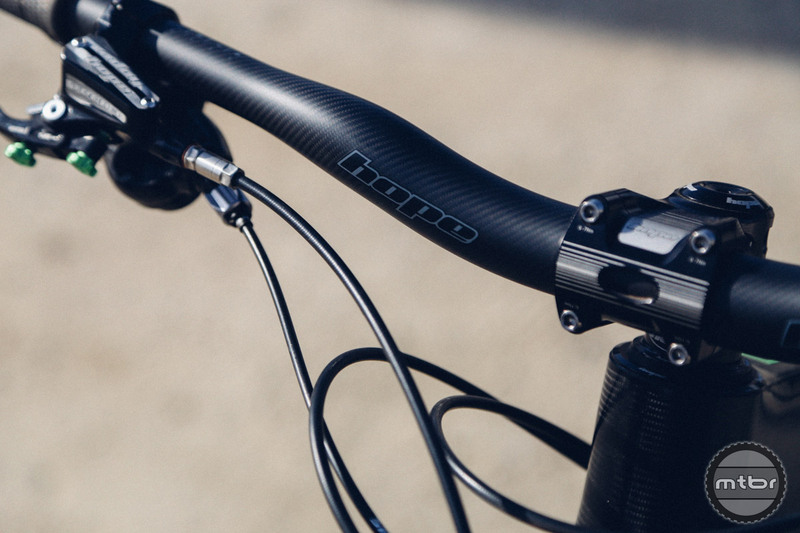 While Hope is best known for their intricately CNC’d components, the company recently expanded its UK facility to produce carbon products like handlebars and seatposts. To showcase their manufacturing capabilities, they used their machining expertise to create a carbon mold for this frame’s front triangle. 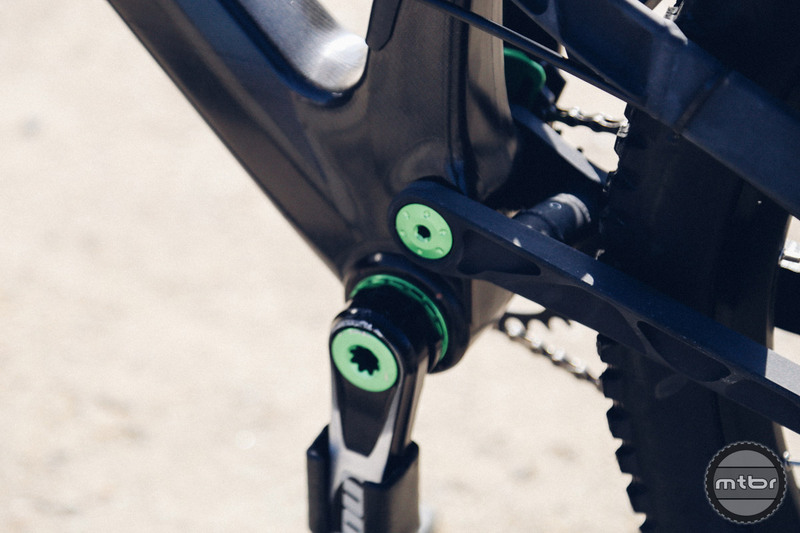 The headset is a standard affair, but the bottom bracket uses a custom interface with 30mm bearings. Further back, they used a specially dished rear end to build a dishless wheel. 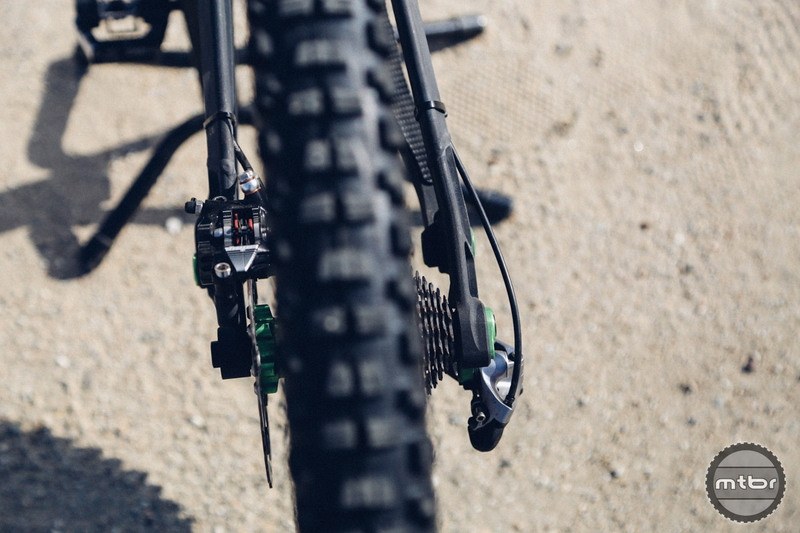 To do this, they moved the drive side chainstay out to improve BB clearance, then moved the non drive side chainstay in to help keep the rear end narrow. 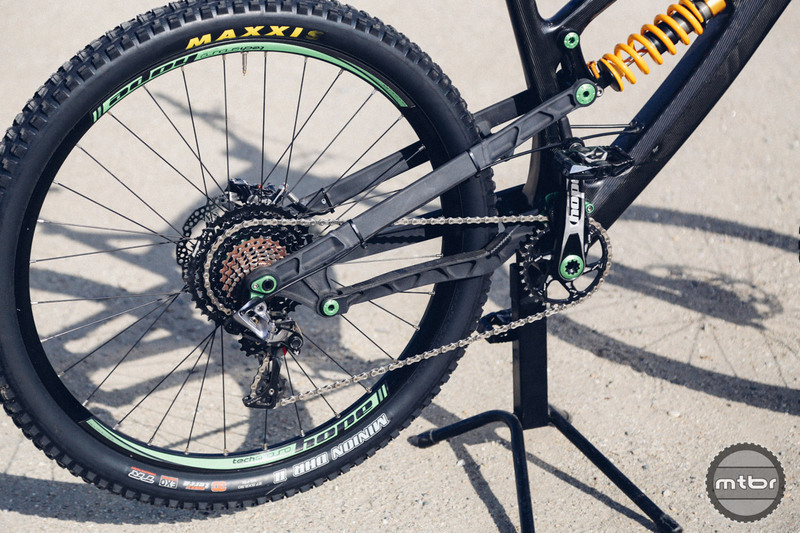 The entire setup clamps to a 130mm wide hub with a 17mm axle, for maximum stiffness. Rather than relying on clunky spacers, the HB211 uses radially mounts to make adjusting between rotors simple (click to enlarge). 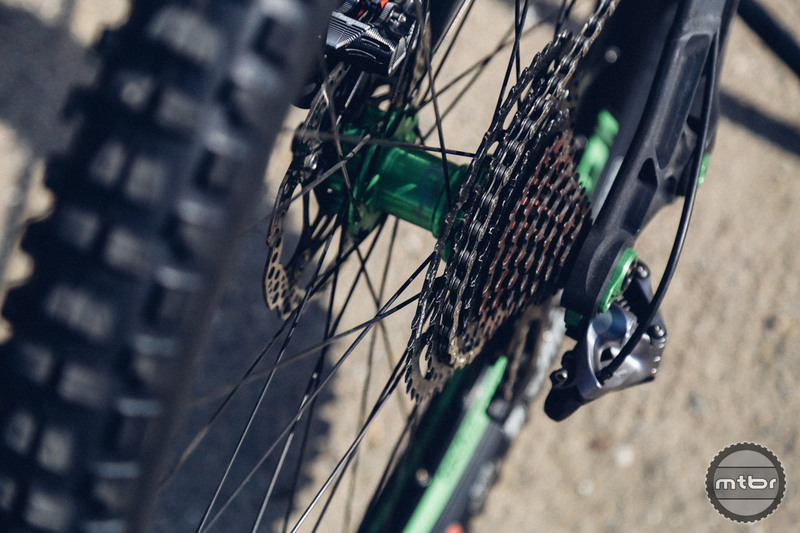 Borrowing a page from the motorcycle world, Hope chose to use a radial rear disc mount to drastically simplify changing disc brake rotors of various sizes. Rather than hunting for the correct adapter, spacers are the only thing required for adjusting the brake caliper inward or outward. This project bike may never see the light of day, but as a design project, it offers some interesting insight into what the future may hold. 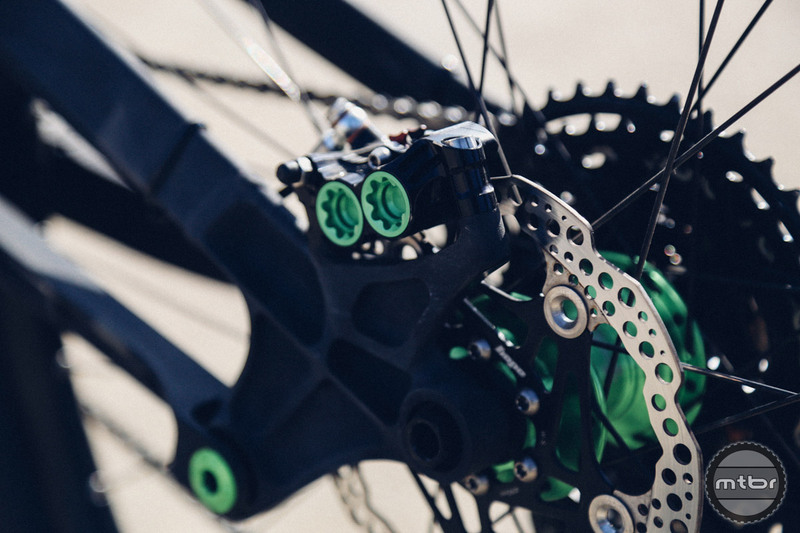 For more info, visit www.hopetech.com. 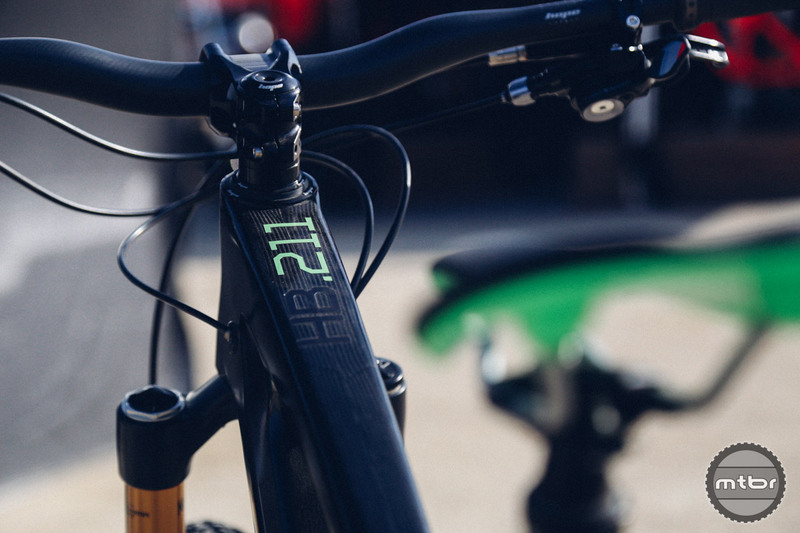 This custom one off carbon mountain bike is named after the RB211 engines built by Rolls-Royce to power airplanes. Hope recently released a line of carbon handlebars and seatposts that are produced in their UK factory. There are very few components on this build that aren’t produced by Hope. 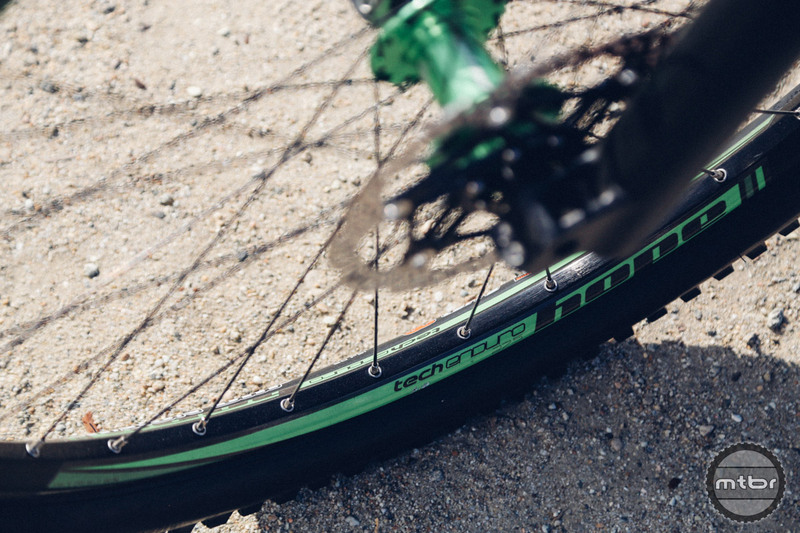 When was the last time you rode a mountain bike with 130mm rear spacing? Rather than relying on clunky spacers, the HB211 uses radially mounts to make adjusting between rotors simple.